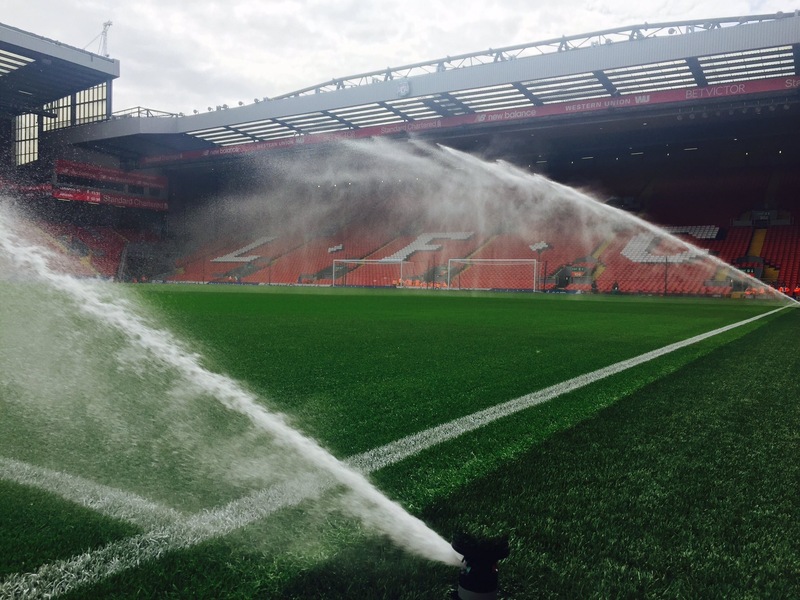 The football pitch at Anfield had been in place for 15 years butthe drainage and irrigation system had been in place since 1998. A change was long overdue. Liverpool FC sought the most advanced system to meet the requirements for a world class premier league team. SELSports installed this innovative under pitch drainage and air blanket system which comprised a layer of 85mm Permavoid units, laid on a welded reinforced impermeable membrane, protected by a heavy-duty geotextile. The Permavoid units provide a void through which surface water can rapidly drain and air can be blown through for soil aeration. There are eight sprinklers located on the pitch which are housed in bespoke irrigation chambers which had a membrane skirt to allow a watertight welded seal to the surrounding membrane. The working area was restricted within the stadium, so materials were transported in across the laid Permavoid blanket as works progressed using a lightweight, low load bearing, compact tractor. The main contractor Hewitt Sportsturf were delighted with the drainage installation, and they ensured the finished article was impeccable.